After a short break, our popular Stories behind Words series returns albeit with a bit of a twist. These new stories will feature interesting terms and phrases – where they come from and how they have changed over time. 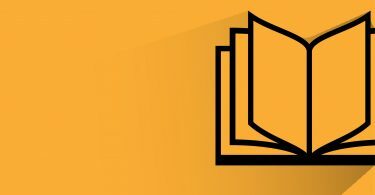 Our first story in this new series, written by regular contributor Liz Potter, discusses the word dench. Would you like to suggest a word for the series? 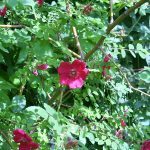 Contact us – we’d love to hear from you! 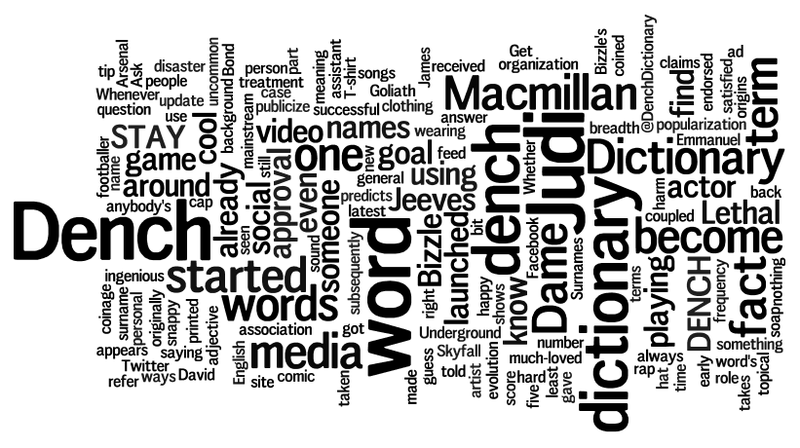 So when the adjective dench (or Dench) started to be bandied around in 2012 as a general term of approval, with a meaning similar to ‘cool’, some people’s thoughts would have turned to the renowned English actor Dame Judi Dench. In fact Dame Judi had nothing to do with the word’s evolution – though perhaps quite a bit to do with its subsequent popularization. 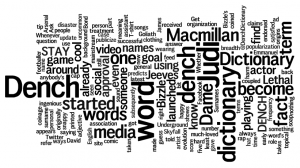 Dench made it into the dictionary not because it’s topical but because it satisfied our usual criteria (in terms of frequency and breadth of use). It’s hard to know why some words are more successful than others (after all, there are plenty of other ways of saying something is ‘cool’). In this case, the (unintentional) association with Judi Dench won’t have done any harm, coupled with the fact that it’s short, snappy, and has a satisfying sound. Whether it will still be around in five years’ time is anybody’s guess. You are really great, it’s always so interesting to read and learn about the story of new words.